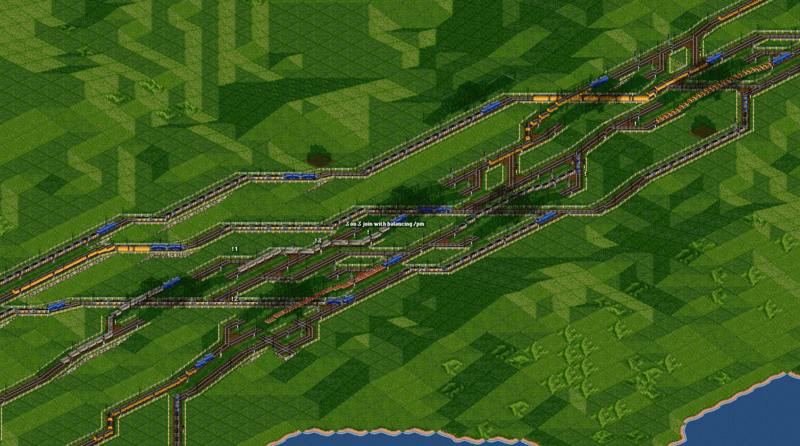 We built 600 trains with a train-length of 8 tiles. They bring a network quite into struggle. But our massive tracks with 4 lanes or more were able to handle the traffic. 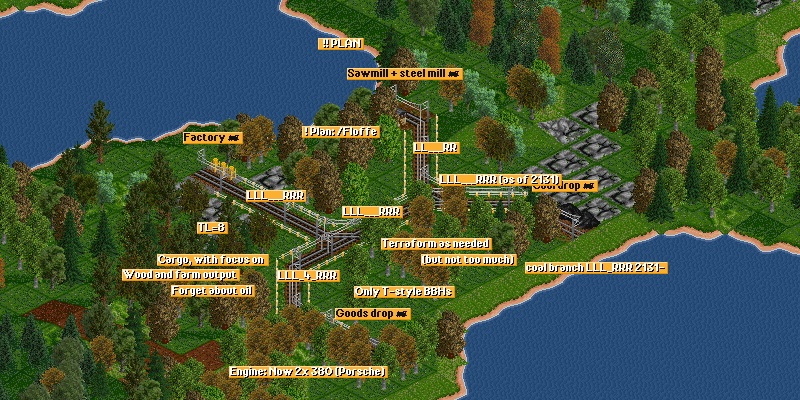 Remember, those trains use as much tiles as 1200 4 tile trains. Our network flow was notably affected by the reliability of two major Backbone-Hubs. The terraforming restrictions made building always a conflict between the look-alike and efficiency. 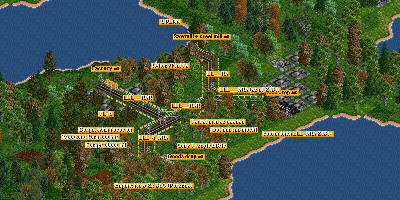 This game was also nice because of the small planned network. 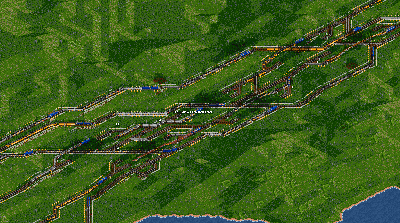 I really like to adapt a network to the trains. 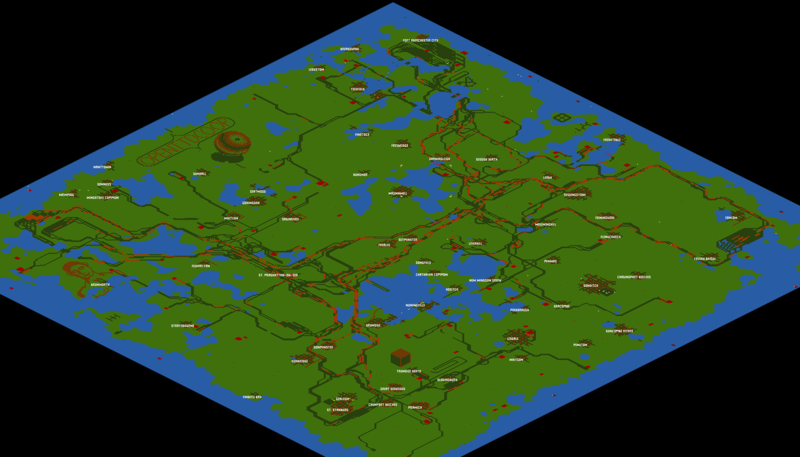 Starting with a small network and extending it to its needs is much more fun than building a big network which is almost empty. We did pretty well in this game. In the end it is not jamming, but if you change something badly it will jam within seconds. To ensure a less jammed network while building or messing it is absolutely necessary to build bypasses and re-route trains. Sometimes this didn’t work and the ignore-signal-button turned into evilness. Anyway I am still messing around with the ‘worst case’ problematic’, which is worth an own posting. The worst case occurs when a train enters a track, but at the point of joining the signal turns red and the train blocks a complete track. My SML Shiftback was removed because it ‘failed miserably’. Well, I’d say it didn’t fail, but worst cases make a builders life hard and SML Shiftback is important for a homogeneous network flow. Some more information about the Shiftback problematic will follow soon. My major critic is that I discovered too many bad placed signals. Please have a loot at the article about signalling. A nice game and I hope we will play more of this kind soon. I was able to build a very nice variant of the SML Shiftback in my experimental game. Tomorrow I’ll post video & details of SML shiftback. Especially the ‘worst case’ is solved nicely, that’s the most important thing.